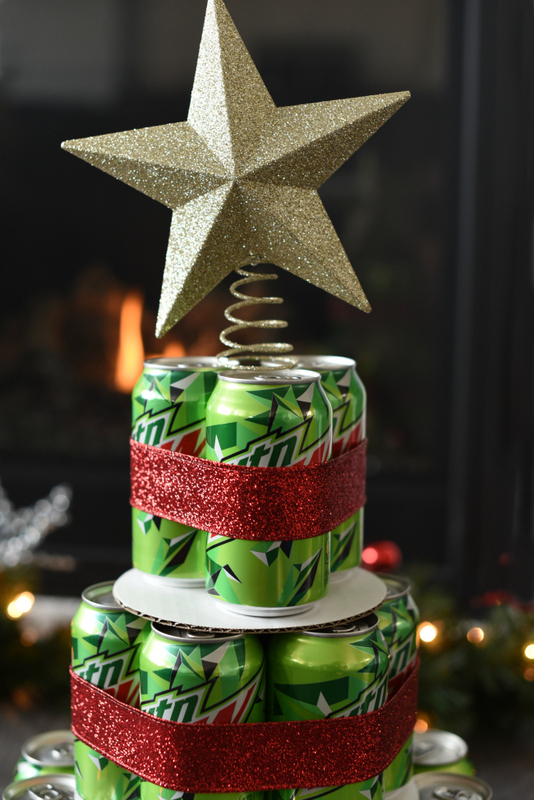 A Peek at the Fun: Need a Mountain Dew gift for someone for Christmas this year? 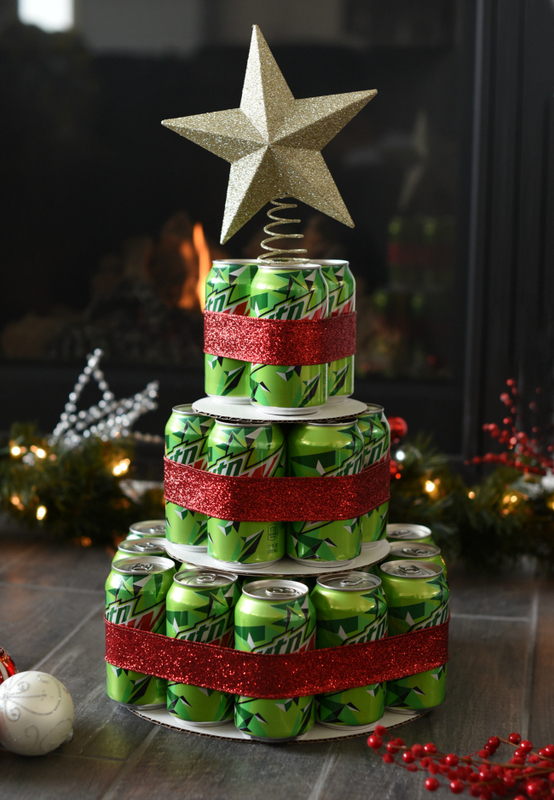 Surprise them with something crazy and creative, a Christmas tree made entirely of Mountain Dew cans! We understand being passionate about things. Danetta lives for Diet Coke and lip gloss, Amber doesn’t go through a day without chocolate and planners. We like what we like and we like to keep those things around always. 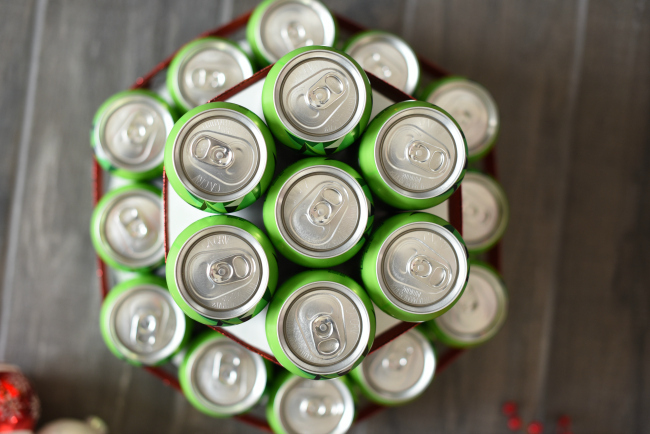 We know you know someone who loves Mountain Dew and you know they’d love a Mountain Dew gift for Christmas this year! 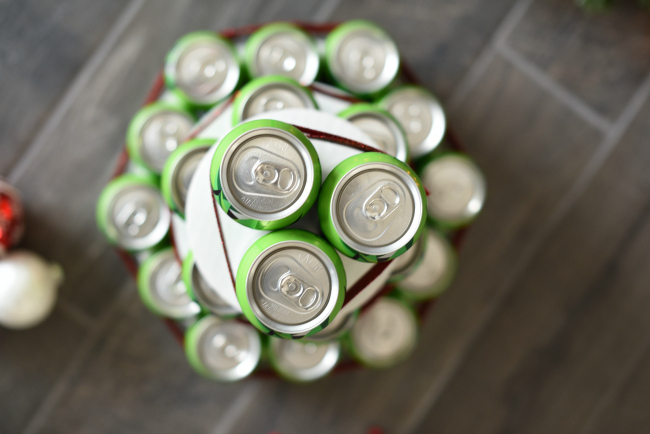 Make them this fun Christmas tree from Mountain Dew cans! 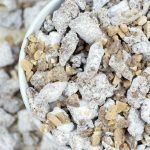 Or, if they love a different kind of soda, this will work with anything! 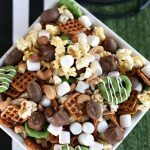 Make it festive however you want. For example, red ribbon with Diet Coke or silver ribbon with Dr. Pepper. Anything works! It also works great as a birthday present if you leave the star off the top. 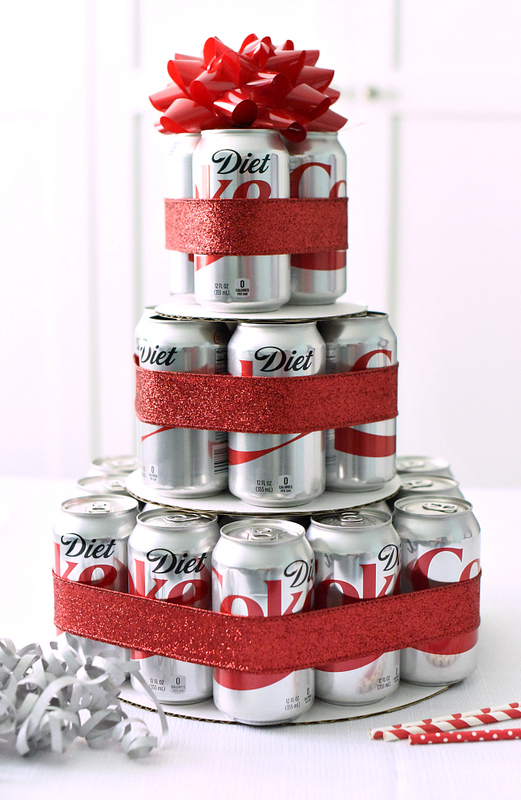 Like this fun Diet Coke gift cake that we did as a birthday gift! 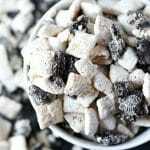 Start by building the bottom layer and work up from there. 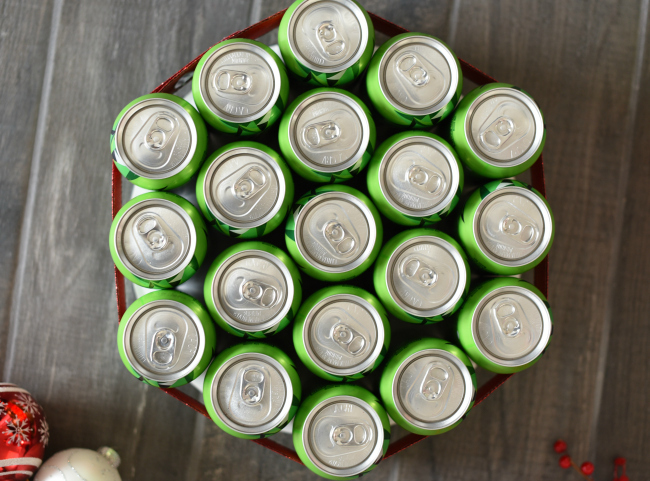 You’ll take the 12-inch cake board and place 19 of your cans on it. They will overlap the edge just a little bit. 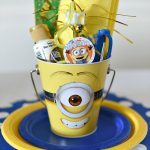 Then pull your ribbon around it and hot glue it on the back to hold it in place. Try to get it fairly tight because this will help the cans stay in place better. Then grab your 8-inch board and work on your next layer. You will use 7 cans on this layer. Do the same thing with the ribbon here. Then finish it off with 3 cans on the 6-inch cake board for the top. Add the ribbon here too. Add your star to the top. You may need to hot glue it to have it stay in place. And you’re all set! 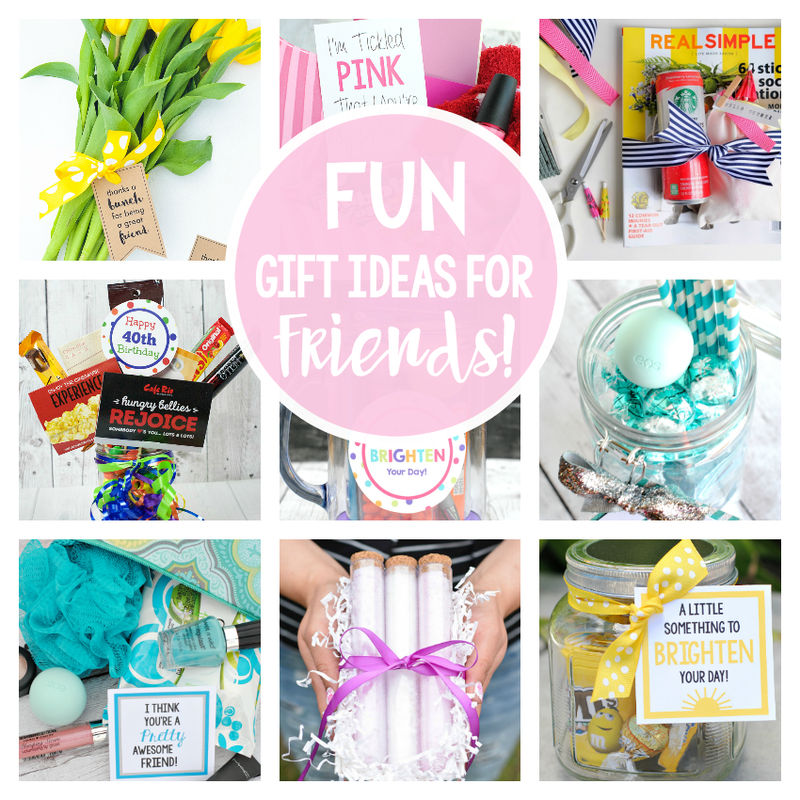 What a fun gift! 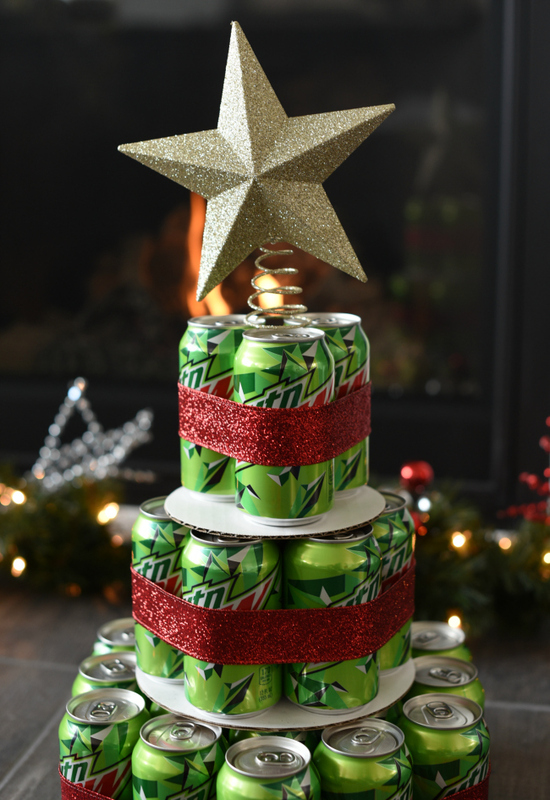 Have FUN giving this Mountain Dew gift for Christmas! One question: how do you transport it? It seems like it would be really heavy! Ha! You’re right! It would be heavy. The layers can be transported separately though and then pieced together there.